I replied that I would rather remember Bob Dylan’s classic song, Forever Young. But the receipt of a Medicare card is not the only sign that I’m now, to put it gently, a senior counselor. At my birthday dinner the other night at one of my favorite restaurants, the wait staff brought me a birthday cake for dessert. It had only one candle on it. Not 65 candles, just one solitary candle. When I asked where the rest of the candles were, I was told that when you turn 65, you only get one candle. The fire marshal will not allow you to have more. 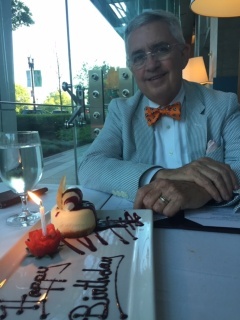 Another sign that I’m an old codger is the fact that last weekend, many friends congratulated me on being “65 years young.” Not 65 years old, mind you. 65 years young. You know you’re old when on your birthday, people start substituting the word “young” for old. You remember when you turned 21? Did anybody congratulate you on being 21 years young? Of course not. You were 21 years old and proud of it! But I don’t get offended anymore. I want a discount for everything I eat, everything I wear, and every trip I take. I’m just mad that Starbucks doesn’t offer a senior discount for lattes. And so as I drive along life’s highway with my left turn signal permanently on, I will remember the admonition of Bob Dylan (who is 76 years young) that my heart always by joyful, my song always sung, and may I stay, forever young!